If you love magazines and catalogs, and haven’t transitioned over to a Kindle or e-reader, then you may be interested to hear about how paper manufacturers and magazines are staying eco-friendly. Or not. While some contain 10-15% recycled content and FSC certified paper, most still use 100% virgin paper. Providing post recycling remnants to an agricultural supply company that sells 30,000 tons of it a year to farmers rather then dumping them into a landfill. Partnering with the City of Chicago and its schools to collect paper and textbooks, paying schools, faith and civic groups, etc, for what they collect. Many of us have spoken up by signing up for junk mail reducing lists, but for those who still enjoy the occasional catalog or subscribe to print magazines, publishers need to know that this is a concern of their readers. I was quite dismayed to find out that National Geographic, one of the very few magazine subscriptions I still receive in print, only uses recycled paper for their cover, the remainder of the magazine is printed with virgin paper. If environmentally conscious magazines still haven’t transitioned to a high recycled content paper, then what can we expect from the industry as a whole? I found this petition specifically for National Geographic Magazine, and promptly wrote a letter to the editor pointing out my concern, as I would urge you to do as well. Green America hosts a list of responsible publishers, which is helpful, but comparing ‘responsibly harvested virgin paper’ and 10% recycled content paper when 85-100% recycled content is readily available (and in use by magazines like INC, which uses 100% recycled content) seems like replacing an Escalade with a Hybrid Escalade. In a world with Priuses, its still an Escalade. 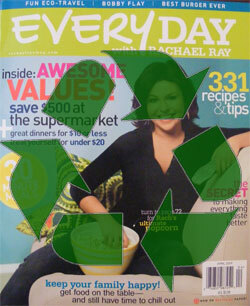 Rachel Ray’s magazine proved it to be successful and embraced by readers overcoming an initial hesitation by Reader’s Digest publishing, now more than 11 other titles under the publisher have embraced the recycled paper movement. With the proven technology by Futuremark and several publishers already taking the steps to become eco-friendly, there really is no reason not to transition magazine and marketing publishing to a higher recycled content standard. As conscious and responsible readers, we should demand more from our magazine and catalog publishers. I have been searching all over the internet for a list of magazines that print entirely or somewhat on recycled paper and this is the first helpful link I’ve found.